Due to resource constraints caused by sequestration, Air Force Space Command officials have directed the 21st Space Wing to prepare to discontinue operations at the Air Force Space Surveillance System by Oct. 1. Final decisions on all fiscal 2014 budget issues will be made over the next few weeks. By discontinuing operations, the AFSSS would not be maintained in operational status; however, equipment will not be removed until a final disposition determination is made. The AFSSS sites are operated under contract and the 21st SW has notified the vendor, Five Rivers Services in Colorado Springs, Colo., that it most likely will not exercise the next contract option beginning Oct. 1. By de-activating the AFSSS by Oct. 1, AFSPC would see a cost savings of approximately $14 million per year, beginning in fiscal 2014. AFSPC officials have devised modified operating modes for the Perimeter Acquisition Radar Characterization System at Cavalier Air Force Station, N.D., and for the space surveillance radar at Eglin Air Force Base, Fla., which allows the discontinuation of AFSSS operations while still maintaining solid space situational awareness. The AFSSS is a series of three transmitters and six receivers along the 33rd parallel stretching across the southern United States.The three transmitter sites are located at Jordan Lake, Ala.; Lake Kickapoo, Texas; and Gila River, Ariz. The six receivers are located at Tattnall, Ga.; Hawkinsville, Ga.; Silver Lake, Miss. ; Red River, Ark. ; Elephant Butte, N.M.; and San Diego, Calif. The two receiver sites at Tattnall and Silver Lake were deactivated in April of this year. The AFSSS, which has been operational since 1961, is just one part of AFSPC’s global Space Surveillance Network. The system is designed to transmit a “fence” of radar energy vertically into space to detect all objects intersecting that fence. The operational advantage of the AFSSS is its ability to detect objects in an un-cued fashion, rather than tracking objects based on previous information. The disadvantage is the inherent inaccuracy of the data, based on its dated design. The new operating modes at Cavalier AFS and Eglin AFB will provide more accuracy than the AFSSS and still collect un-cued observations. The AFSSS is typically referred to as the “space fence,” which has caused confusion with the new space fence being developed for the future. Unlike the AFSSS, the new space fence will provide very precise positional data on orbiting objects and will be the most accurate radar in the Space Surveillance Network. It will provide enhanced space surveillance capabilities to detect and track orbiting objects such as commercial and military satellites, depleted space boosters and space debris. The new space fence will have much greater sensitivity, allowing it to detect, track and measure an object the size of a softball orbiting more than 1,200 miles in space. Because it is also an un-cued tracking system, it will provide evidence of satellite break-ups, collisions, or unexpected maneuvers of satellites. “When combined with the new Joint Space Operations Center’s high-performance computing environment, the new fence will truly represent a quantum leap forward in space situational awareness for the nation,” Shelton said. On August 6, 2013, news broke that the commander of Air Force Space Command (AFSPC), General William Shelton, had ordered the shutdown of the Air Force Space Surveillance System (AFSSS) by the beginning of the new fiscal year on October 1. This article aims to shed some light on the technical, budgetary, and political considerations behind the decision to shut down the AFSSS. The loss of the AFSSS is not likely to have a significant impact on the accuracy of objects in the existing satellite catalog or the ability of the US military to track medium to large size objects in orbit. The real impact will be the loss of the AFSSS’s ability to do uncued detection of breakups and maneuvers across a huge area of Earth orbit and act as a “trip wire” to warn about events in space. Thus, the shutdown of the AFSSS is more likely to negatively impact broad area surveillance aspect of space situational awareness (SSA) than the tracking accuracy aspect of space surveillance. Furthermore, an examination of the fiscal year 2014 budget documents indicates that the decision by AFSPC to shut down the AFSSS is most likely a high-stakes gamble by AFSPC to bolster the long-term survivability of the new S-Band Space Fence it wants to acquire. It does not appear to be directly related to sequestration, as the FY14 defense budget as drafted by the White House and submitted to Congress does not include any of the mandatory cuts required by sequestration, nor does the appropriation and authorization legislation currently being debated in Congress. The most likely explanation is that the AFSSS is being cut to bolster AFSPC's argument for keeping the new S-Band Space Fence program when sequestration does get applied later this year or in early 2014 and the Pentagon is then forced to make difficult choices on which procurement programs stay alive. The AFSSS (also known as the Space Fence) is a key component of the US military’s Space Surveillance Network (SSN), which tracks more than 23,000 manmade objects in Earth orbit. This tracking information is used by the US military as part of its SSA efforts. 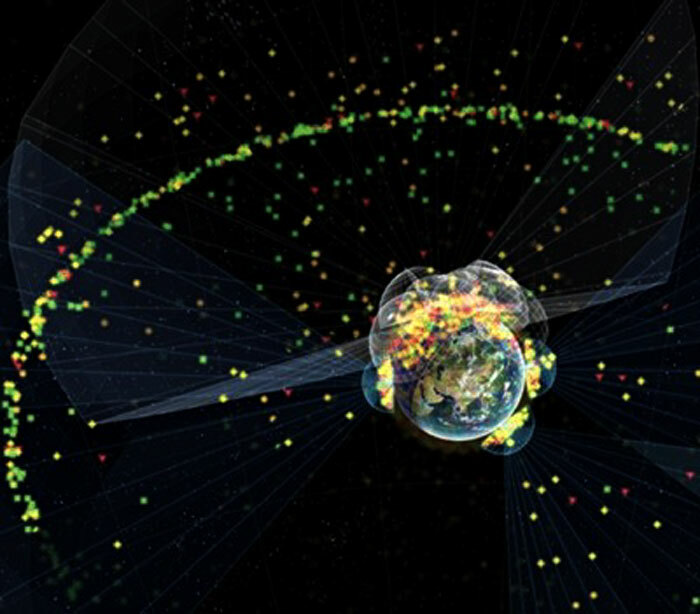 These include detecting potential natural or manmade threats to its satellites and close approaches with other space objects that could result in devastating collisions. The US military also uses the data to offer a close approach warning service for owner-operators of the more than 1,000 active satellites in orbit. In 2012, satellite operators conducted 75 maneuvers to avoid potential collisions as a result of those warnings. The announcement of the shutdown created quite a stir among those concerned about space security and sustainability, along with a considerable amount of confusion in the press. Space surveillance, the art of tracking objects in space, is a highly technical and esoteric discipline even within the US Air Force, which is responsible for much of the space surveillance mission within the Pentagon. Military professionals who have worked in the space surveillance world are few and far between and often spend only a short period of time within the field before moving on to other things. Those with the deep experience and understanding to truly know the system are extremely rare. Space surveillance is also part of the larger mission of SSA, which is extremely important for all activities in space but currently has many different definitions and competing interests jockeying for position on roles and responsibilities. This article examines the decision to shut down the AFSSS in four parts. Part 1 discusses the technical side and details what the existing AFSSS does, the role it plays in both space surveillance and SSA, and explains why eliminating the AFSSS is more likely to impact the latter than the former. Part 2 then moves to the budget side of the discussion and outlines the choices AFSPC likely faced in making this decision. This is a particularly murky subject, as the decision itself was made privately within AFSPC and very little public information is available. The evidence suggests that there is a very different situation going on behind the scenes than what is contained in the budget public documents currently before Congress. Part 3 of this article discusses the new S-Band Space Fence the Air Force is procuring to replace the AFSSS. Many mistakenly view this new program as an upgrade to the existing AFSSS. In reality, the AFSSS and proposed new S-Band Space Fence are two completely different systems with different capabilities. While it is true that the S-Band Fence on paper presents a significant increase in capability, the procurement is already years behind schedule and the final capabilities of the S-Band Space Fence have been trimmed considerably from initial plans. The ability to utilize the capability of the S-Band Fence also depends on the success of another very troubled acquisition program, the Joint Space Operations Center Mission System (JMS), to replace many of the core computer systems used by the US military for SSA. Part 4 of this article concludes that the most likely explanation for shutting down the current AFSSS is that AFSPC hopes it will cement the commitment from the Pentagon to fund the new S-Band Fence. Betting the future of the US military’s ability to understand what’s going in space on these two acquisition programs is an understandable but very risky decision. At best, it means a six-year wait before both the S-Band Space Fence and JMS are fully operational. But for that to happen, both JMS and the S-Band Space Fence need to execute their current acquisitions programs without further difficulties. Should either falter, it means a long-term worsening of the US military’s space surveillance capability, which, in turn, will degrade its SSA. This will result in more uncertainty about events in orbit, greater risk of on-orbit collisions for all active satellites, and a less sustainable space environment over the long-term for everyone. To understand the value of the AFSSS and radar “fences” in general, we first need to understand how radars function and are used for tracking objects in space. Radar consists of at least one radio transmitter and receiver. The transmitter emits radio waves at a specific electromagnetic frequency. Some of these waves reflect off the target and are measured by the receiver, which is then able to calculate the location of the target in relation to the radar. At the beginning of the space era, two radar concepts were available for space object tracking. The first is an interferometer-based system, also known as a bistatic radar, where the receiver and transmitter are separated by a specific distance. Bistatic radar systems are especially well suited to so-called “fence” applications, where a continuous amount of energy is emitted in a certain direction. All objects passing through this “radar fence” will thus be tracked. The bistatic concept is illustrated in Figure 1. The second initial radar concept was a monostatic radar that had collocated transmitting and receiving antennas, usually mounted on a parabolic dish that could be rotated and elevated. Monostatic radars mounted in this fashion are also known as mechanical trackers and are especially well suited to precision tracking of one or a few objects. With enough power, monostatic radars can also be used to track space objects in the geostationary Earth orbit (GEO) region, which is at an altitude of more than 36,000 kilometers (22,300 miles). In regions with inclement weather, mechanical tracking radars are usually mounted inside domes that are made of a material that is transparent to EM radiation at their operating frequency. 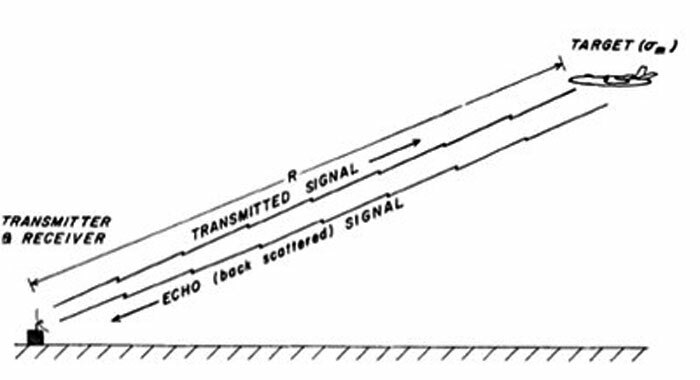 Figure 2 shows an example of monostatic radar. The development of phased array antennas added a new level of capability for radars. A phased array is a collection of small, identical antennas, usually mounted on a fixed “face,” which can vary the phases of their respective signals. By doing so, the effective radiated energy can be “steered” or focused in a specific direction and multiple independent “beams” of energy can be individually steered to multiple targets at once. Phased arrays tend to have more complicated supporting systems than mechanical radar, but much more flexibility in how they allocate their radar energy. Figure 3 shows an example of a monostatic phased array with two separate faces operated by the US military for both missile warning and space surveillance. The AFSSS is a multistatic, interferometric radar that was brought online by the Navy in 1961 as the Naval Space Surveillance System (NAVSPASUR). The NAVSPASUR consisted of three separate transmitting stations and six receiving stations located along a “Great Circle” across the southern United States. The main transmitting antenna at Lake Kickapoo, Texas, stretches 3.2 kilometers (2 miles) in a north-south direction. Combined with the two other smaller transmitters in Arizona and Alabama, the system continuously broadcasts more than 800 kilowatts of radio waves up into space at a frequency of 216.98 MHz. This forms a wall of radar energy that stretches 9,200 kilometers (5,700 miles)from the Pacific Ocean to the Atlantic Ocean and to an altitude of approximately 28,000 kilometers (17,000 miles). Any object in orbit larger than a certain size that passes through this wall sends a reflection of some of that radar energy back to Earth. This includes thousands of objects in low Earth orbit (LEO), medium Earth orbit (MEO), and highly elliptical orbits (HEO). The six receiving stations each have massive rectangular arrays of antennas measuring 730 meters (800 yards) on the north-south axis and 365 meters (300 yards) on the east-west axis. These antennas detect the reflected radar energy and, by comparing the phase of the radar return at two or more stations, it is possible to calculate the location of the object in space. This calculation is done at a central processing center located at a Navy base in Dahlgren, Virginia. The facility at Dahlgren also converts the data from the AFSSS into observations that can be processed by US Strategic Command’s (USSTRATCOM’s) Joint Space Operations Center (JSpOC) located at Vandenberg Air Force Base in California. The Dahlgren location also serves as a backup to the JSpOC in case of an emergency. Figure 4 shows the elements the NAVSPASUR system. The AFSSS is different from all the other radars in the SSN because it is a continuous wave radar. A continuous wave radar is constantly sending out radar energy. Everything that passes through it will send a return, but the continuous radar cannot tell the range to an object. This is similar to a police officer using a continuous wave radar in a speed trap: the radar can accurately tell him that something went through the trap very fast but not exactly which one it was if multiple cars went through at the same time. In the case of the AFSSS, this results in its observations being less accurate in range than other radars in the SSN. All the other radars in the SSN are pulsed radars, which operate by sending out short pulses of radio energy in a particular direction and waiting for it to return before sending the next pulse. The wait is necessary because the radar cannot transmit and listen at the same time. If a pulsed radar is actively tracking an object by sending multiple pulses over a short period of time, it can determine the range to that object very precisely. In 2003, Secretary of Defense Donald Rumsfeld directed the Navy to transfer program management of NAVSAPSUR to the Air Force. The Air Force requested that the Navy maintain operational control through the end of fiscal year 2004, so the Navy officially transferred operations of the NAVSPASUR to the Air Force in October 2004. The Air Force renamed the system the AFSSS. As recently as 2012, the AFSSS was collecting more than five million observations on space objects each month. This accounts for more than 40 percent of the 12 million observations the entire SSN collects each month. However, these numbers are misleading when it comes to evaluating the loss of the AFSSS from the SSN, because of the way the catalog maintenance process for updating an objects orbit in space is handled by the JSpOC. The observations the SSN as a whole collects are important for maintaining accurate orbits on space objects. Over time, natural forces called perturbations alter an object’s orbit. Space objects need to be periodically tracked to update their orbits to reduce the error in calculations such as detecting future collisions. As it is impossible to track everything all the time, the JSpOC uses a complicated algorithm to allocate its limited tracking capacity as efficiently as possible. The algorithm takes into account the rate of change of an object’s orbit due to perturbations, as well as the object’s priority, and uses that to calculate how often it needs to be tracked and which sensors are the best ones to do so. These sensors are then tasked to track the object during the next day, collecting observations, which are then sent to the JSpOC to update the object’s orbit. The whole cycle then repeats. The AFSSS is not included in this routine tasking cycle because it is an uncued sensor used for surveillance, not tracking. It detects objects that pass through its radar fence automatically without needing to be told to do so. Thus, eliminating it will not significantly impact the ability of the SSN to routinely track medium to large space objects. The other significant limitation of the AFSSS is in the size of object it can track. The AFSSS is limited to tracking objects about 10 centimeters (4 inches) in size out to about 2,000 kilometers (1,200 miles), and objects about 1 meter (3.3 feet) in size out to about 18,500 kilometers (11,500 miles). This limitation is primarily the result of the frequency it operates at (216.98 MHz). The higher the frequency, the smaller size object that can be detected by a radar. The Cobra Dane radar operates at a frequency near 1.2 GHz and can detect and track objects as small as five centimeters (2 inches) at an altitude of 600 kilometers (373 miles), making it the most sensitive radar in the SSN for tracking small debris objects. Most of the SSN phased array radars operate at around 440 MHz, and, in general, the database of tracked orbital objects maintained by the SSN only includes the 23,000 or so objects larger than 10 centimeters. The AFSSS does have some capabilities that other sensors in the SSN do not. These unique capabilities are largely due to it being a continuous wave radar: everything bigger than minimum detection size that passes through its surveillance fence will generate a return. The mechanical tracking pulsed radars in the SSN can only generate detection fences by conducting what’s known as a “raster scan.” A raster scan works by sending out a narrow beam of radar energy to a particular point in the sky, waiting for it to come back, and then sending out another narrow beam of radar energy to another point right next to the first one. The process then continues until the area being scanned is covered, and then repeats. The phased array pulsed radars are somewhat better in that they can send out multiple pulses at the same time in their raster scans, but they are still painting a distribution of dots that switch on and off rather than a continuous fan of energy. This means that the detection fences generated by other radars in the SSN have significant limitations compared to the surveillance fence generated by the AFSSS. The pulsed radars can only detect an object if they happen to be beaming radar energy at that particular point in space at the same time the object is occupying that space. There can be gaps in the detection fences generated by the other radars, especially the mechanical trackers. Depending on how quickly the raster scan is done, a mechanical tracking radar can miss objects. If an adversary can figure out the raster scan pattern, they can exploit the gaps. For a phased array, an object that is moving fast enough to be picked up by multiple beams can confuse the radar into thinking it’s actually multiple objects. The AFSSS’s unique ability to create a surveillance fence instead of a detection fence comes in handy in a couple different situations. One of the most significant is its ability to characterize breakups in space. A breakup occurs when a single object, such as a satellite or rocket body, shatters into multiple pieces due to any number of factors. These include long-term exposure to the extreme hot and cold temperature changes in space and intense radiation, which can weaken structural components and cause pieces of a satellite to break off. These same forces can cause dead satellites and spent rocket stages with energized batteries or leftover fuel to explode. Breakups can also happen as the result of collisions between two objects in space. As of the end of February 2009, there were eight known or suspected collisions between two objects in space. The most extreme of these was the February 2009 collision between an active US Iridium commercial communications satellite and a defunct Russian Cosmos military communications satellite, which resulted in the creation of nearly 2,000 trackable pieces of new space debris. And in some cases breakups can be the result of the deliberate destruction of a satellite, as was the case in January 2007 when the Chinese military destroyed one of their own weather satellites in the test of an anti-satellite (ASAT) weapon system, creating more than 3,000 pieces of new space debris. 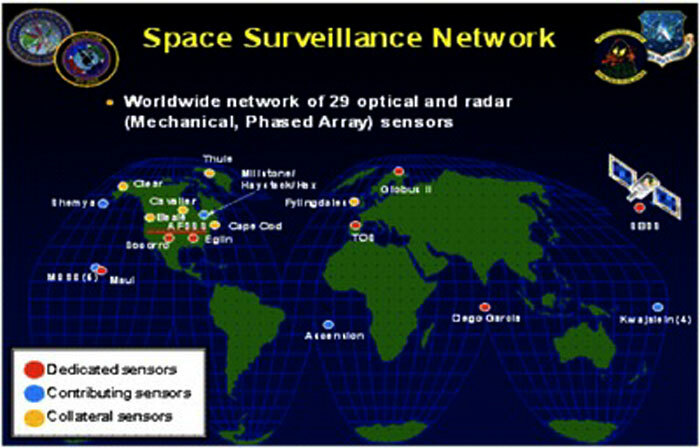 The surveillance fence capability of the AFSSS also makes it very useful for detecting maneuvers of space objects. Many satellites have the ability to change their orbits for a variety of reasons. Satellites in LEO often maneuver to counter atmospheric drag by boosting a satellite back up to a higher orbit. Imaging and other types of intelligence, reconnaissance, and surveillance satellites may maneuver to change their ground track to acquire targets or surprise an adversary. Co-orbital ASAT weapons, if ever deployed, need to maneuver in orbit to intercept their targets. While all the sensors in the SSN can theoretically detect if an object has maneuvered, most need to have been tasked to track an object to do so. The AFSSS, by virtue of its uncued tracking capability, can detect maneuvers for just about any object in orbit with inclinations higher than 33 degrees and out to 17,000 miles (28,000 kilometers). The August 2013 press release from AFSPC outlining the AFSSS shutdown states that they have “devised modified operating modes for the Perimeter Acquisition Radar Characterization System [PARCS] at Cavalier Air Force Station, N.D., and for the space surveillance radar at Eglin Air Force Base, Fla., which allows the discontinuation of AFSSS operations while still maintaining solid space situational awareness.” These new operating modes involve radar detection fences established by both PARCS and Eglin, each with their own advantages and disadvantages. While PARCS is limited to establishing fences and tracking objects in LEO, Eglin does have some capability to track objects in deep space, potentially out to GEO. It is likely that the existing radar fences Eglin establishes at 25 degrees elevation and 35 degrees elevation would be extended or have increased share of power to make up for the loss of the AFSSS. The power output that goes into establishing and maintaining these fences would mean a decrease in the power available for Eglin to perform other space surveillance functions. Additionally, while the pulsed detection fence generated by Eglin will have the limitations outlined earlier, PARCS has a unique capability to track every detectable object in its field of view. Compared to the capabilities of the AFSSS, the only disadvantage PARCS has for uncued detection in LEO is that it is limited to objects in a higher inclination than the AFSSS and its field of view covers a much smaller area than that of the AFSSS. Putting these capabilities together, the claim by AFSPC that shutting down the AFSSS will not significantly impact space surveillance is valid. From the perspective of a quantitative analysis that looks at the overall accuracy of the tracking of medium to large space objects, losing the AFSSS will not have a significant impact. The question is whether or not that is the right metric to use in judging the value of the AFSSS. Space surveillance and the accuracy of orbit determination is only one factor in the broader mission of SSA. Wide area surveillance, alerting, and uncued detection also play important roles, as do surge capacity for major events such as large breakups. It is here the loss of the AFSSS will be noticed, but the plan to use both the capabilities of PARCS and Eglin to replace at least in part the uncued detection capability of the AFSSS is a reasonable mitigation, at least for higher inclination objects in LEO. The technical capability of the AFSSS is only part of the equation. Another major piece of the equation is the money available to fund space surveillance activities. An analysis of the budget circumstances surrounding the AFSSS reveals a complicated situation. There is significant political pressure from both Congress and the White House to trim the military budget. This pressure has taken two major forms. One is a set of voluntary cuts the Pentagon and White House put in place starting with the FY14 budget. These voluntary cuts amount to a decrease of $100 billion in defense spending between 2014 and 2023 compared to what was originally planned. The second piece of budgetary pressure is the mandatory cuts to federal spending included in the Budget Control Act of 2011, commonly known as sequestration. These mandatory cuts came into force in March 2013 and amount to an additional $1.2 trillion decrease in federal spending over the nine-year period from 2013 to 2021. The Department of Defense’s (DoD) share of these cuts is $492 billion, which is in addition to the $100 billion in voluntary cuts above. The way that Congress appropriates funds for the US military’s budget often makes for some complication and illogical choices in where funding cuts can be applied. In this particular case, where the funding for operating the AFSSS and other sensors in the SSN comes from and what those choices are is not necessarily where one would expect. Broadly speaking, military appropriation is divided into five separate categories: Research, Development, Test and Evaluation (RDT&E); Procurement; Operation and Maintenance (O&M); Military Personnel (MILPERS); and Military Construction (MILCON). RDT&E funds are used to do basic research and development, including that which leads to the development of new types of weapon systems. RDT&E funds are also used for testing, check-out, and evaluation of newly-acquired systems. Procurement funds are used to purchase major new military systems where the research and development has already been done. After a system has been acquired through either procurement or RDT&E funding and is operational and fully tested, its continued operations for the duration of its lifespan are usually paid for by an O&M budget line. The O&M funds cover everything from the pay for the civilian personnel to operate a system to the electricity it consumes and parts that need to be replaced. MILPERS funds are used to fund the cost of salaries and compensation for active military and National Guard personnel. Finally, MILCON funds are used to cover the costs of major military construction projects such as bases, facilities, and military schools. 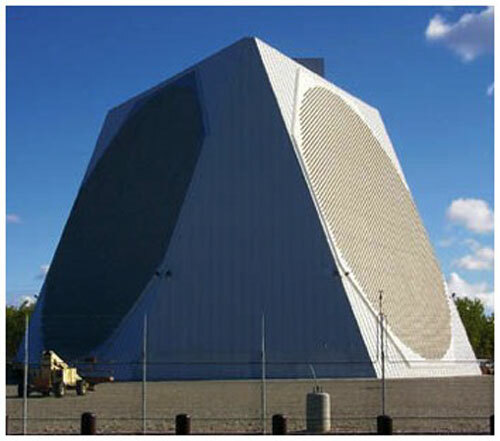 AN/FPS-85: A large, single-face phased array radar located at Eglin Air Force Base in Florida that can track objects in both LEO and deep space. Ground-Based Electro-Optical Deep Space Surveillance (GEODSS): A set of three operational sites located in Maui, Hawaii; Socorro, New Mexico; and Diego Garcia that utilize multiple optical telescopes to track objects in deep space out to GEO. Globus II: A large X-band mechanical tracking radar located in the upper part of Norway that tracks objects in deep space out to GEO. Space Based Space Surveillance (SBSS) System: A satellite in LEO that has an optical telescope which can track objects in orbit out to GEO. Maui Space Surveillance System (MSSS): A set of sensors located on the island of Maui that include the Advanced Electro-Optical System (AEOS) imaging telescope equipped with adaptive optics and four other smaller telescopes. Lincoln Space Surveillance Center (LSSC): Also known as Millstone Hill radar, a set of three mechanical tracking radars located near Boston that can be used for tracking and imaging objects out to GEO. Reagan Test Site: A set of four mechanical tracking radars located on Kwajalein Atoll in the South Pacific that can be used for tracking and imaging objects out to GEO. Ascension: A mechanical tracking radar located on Ascension Island in the Atlantic Ocean off the coast of Africa whose primary mission is to provide radar tracking data to support test and evaluation of developmental and operational ICBMs, space launch vehicles, and aeronautical development programs. Air Force Satellite Control Network (AFSCN): A global network of ground stations and systems that are used to provide Telemetry, Tracking, and Commanding (TT&C) services for US military and other satellites. Global Positioning System (GPS): A constellation of 31 satellites in MEO that provide Positioning, Navigation, and Timing (PNT) services to the US military and other users around the globe. Defense Meteorological Satellite Program (DMSP): A constellation of 20 satellites in LEO that monitors weather, oceanographic, and solar-terrestrial physics for the Department of Defense. The Air Force is responsible for O&M funds for two new DMSP satellites awaiting launch in 2014. O&M funds for all current DMSP satellites are the responsibility of the National Oceanographic and Atmospheric Administration (NOAA). Counter Communications System (CCS): A ground-based offensive counterspace system that prevents adversaries from employing satellite communications against the United States and its allies using a transportable radio frequency (RF) jammer to interferes with adversary command and control (C2) and propaganda transmitted via satellite. Rapid Attack Identification Reporting System (RAIDRS): A ground-based defensive counterspace system that performs attack detection, geo-location, reporting, characterization, and mission impact assessment for US owned, operated, or used space systems. RAIDRS is focused on detecting, characterizing, geolocating, and reporting satellite communications (SATCOM) radio frequency interference using currently existing commercial-off-the-shelf and government-off-the-shelf technology. The discussion over how to apply the budgets cuts to the space control O&M budget line began at least as early as February 2013. That is when the Air Force briefed Congress on the impact of the 2013 sequestration cuts to the budget. The briefing featured one slide on the current actions being taken to implement the voluntary budget cuts put in place with the FY13 budget. This was followed by another slide detailing the future budget cuts that would take place if sequestration was implemented, which at the time was being the subject of negotiations between the White House and Congress. Included in these future cuts was a single bullet point referencing space surveillance: “Various ground radar sites for missile warning/space surveillance reduced from 24 hrs to 8 hrs ops; Missile Defense impact.” This referenced a plan devised by AFSPC to reduce operations at the Cobra Dane, PARCS, and AFSSS radars from 24 hours to 8 hours per day. The assertion made to Congress that these cuts would have significant impacts to missile defense was not fully justified, as neither PARCS nor the AFSSS play any role in missile defense, and Cobra Dane plays only a limited role. However, these cuts would have significant impacts to space surveillance as the three radars are responsible for more than 60 percent of the total observations collected by the SSN, and Cobra Dane is one of the few radars that can track very small pieces of debris. Ultimately, AFPSC decided not to cut back operations at Cobra Dane or to reduce operations at the AFSSS. Instead, in April 2013, AFSPC shut down two of the six receiving stations for the AFSSS, located in Tattnall, Georgia, and Silver Lake, Mississippi, along with cutting back operations at PARCS. The August 2013 press release from AFSPC states that the decision to shut down the AFSSS was due to “resource constraints caused by sequestration.” Decoding the true meaning of this statement is complex. The White House’s FY14 budget request for the Space Control O&M budget line to fund all of those systems described above, including the AFSSS, was $433 million, a reduction of $55 million from the FY13 budget request of $488 million. However, this reduction does not include sequestration. The total FY14 budget request for the entire base military budget as developed by the White House and submitted to Congress includes a top-line spending of $527 billion, $52 billion above the funding cap set by the 2011 Budget Control Act. While it is a reduction from the FY13 budget, this reduction only includes the voluntary budget cuts and does not include those imposed by sequestration. Further, this FY14 budget request appears to include funding for the AFSSS to continue operations. Although the Space Control Systems O&M budget line for FY14 does not specify exactly which sensors are included, it does specify that it includes operations at eight dedicated SSN sensors and seven contributing SSN sensors, the same as the FY13 budget. With no mention of a new dedicated sensor being brought into the network, that number presumably includes the AFSSS for FY14. The FY14 RDT&E budget request also includes $4.7 million for the final year of a three-year life extension program to replace obsolete equipment at the AFSSS. That is not normally something that would happen for a system the military is planning to shut down. The FY14 budget request from the White House is also undergoing minimal change from Congress. Congress implements the budget request for the Department of Defense through the passage of the National Defense Authorization Act (NDAA) and a Defense appropriations bill by each chamber. In doing so, Congress may choose to increase, decrease, or completely eliminate funds that are requested by the White House. However, in this case the current Senate markup of the FY14 NDAA contains the full amount of $433 million requested by the Air Force for Space Control Systems O&M funding, as does the House NDAA markup, the House appropriations bill, and the Senate appropriations bill. These bills have all passed their committees but have not yet been voted on by the full chambers, so they are not yet final. But as the budget currently stands, the funding requested by the US Air Force to continue to operate the AFSSS through FY14 will likely be approved by Congress and signed by the President, meaning AFSPC will have the O&M funds to continue operating the AFSSS in FY14 as requested. Thus, it is difficult to ascertain exactly what is driving the budgetary cuts behind the shutdown of the AFSSS. Based on the public FY14 budget materials, it does not appear to be driven by sequestration, the voluntary cuts by the Pentagon, or Congress. It is not clear why AFSPC needs the $14 million it says closing the AFSSS will save, as the current budget indicates that AFSPC will have the funds it needs to continue to operate the AFSSS through FY14. But there is one more aspect of this decision that we have not yet examined that may shed some light on this decision, and that is the system AFSPC wants to buy to replace the AFSSS. The August 2013 AFSPC press release announcing the shutdown of the AFSSS contains a quote from Gen. Shelton on the confusion that often happens between the existing AFSSS “space fence” and the new S-Band Space Fence that the US Air Force plans to procure. That confusion is understandable and largely due to the decision made by AFSPC to give virtually the same name to what are in reality two very different systems with very different capabilities. They should be viewed more as an existing system and a completely new one, not an existing system and its upgrade. At one time, however, there was going to be an upgrade to the AFSSS. Before transferring ownership of the NAVSPASUR to the Air Force, the Navy had already begun plans for a program to upgrade it. In 2002, Raytheon was awarded a contract for the modernization and upgrade of the NAVSPASUR. This contract included replacing the current VHF transmitters at 216.98 MHz with S-Band transmitters at 2.4 GHz. These modifications would dramatically improve the system’s ability and allow it to track objects as small as five centimeters in size, making it the most capable sensor in the SSN for tracking small objects. This upgrade was due to be completed by the end of 2004 for a total cost of less than $400 million in FY03 dollars (equivalent to $520 million in FY13 dollars). However, the transfer of ownership of the NAVSPASUR from the Navy to the Air Force between 2003 and 2004 disrupted these plans and they fell behind schedule. The Air Force rescinded Raytheon’s original contract and significantly reduced the budget allocations for the now renamed AFSSS in 2005, 2006, and 2008. In 2006, it appears that the Air Force had a change of heart and decided to revisit upgrading the AFSSS, but now starting from scratch. In June 2006, the Air Force issued a formal Request for Proposal (RFP) for a Concept Studies Phase for the AFSSS upgrade, including a Risk Reduction contract effort between FY05 to FY07. The RFP outlined a schedule that included system development, production, and fielding phases beginning in FY08, and award of the development contract award early that year. The RFP stated that delivery of the Initial Operational Capability (IOC) of the upgraded Space Fence was expected in the FY13–14 time frame. Raytheon completed the Risk Reduction phase in September 2006, but the program ran into more schedule slips. The initial contract award for the concept development phase was not awarded until July 2009. Contracts in the amount of $30 million each were given to three companies—Raytheon, Lockheed Martin, and Northrop Grumman—for system design review, plans trades analysis and data, systems engineering planning, architecture planning, and prototyping. The three companies would then compete in the second phase to develop preliminary designs. Only two companies would win these contracts, expected to be awarded in April 2011. The final procurement contract to build the actual system was expected to be awarded to the winning company in 2012. By this time, the Air Force’s plan for the new S-Band Space Fence was radically different than the original Navy plan. Instead of upgrading existing AFSSS sites located in the United States, the Air Force plan called for the construction of three new “geographically separated” radar installations. Locations under consideration included Australia and the Pacific. Instead of multiple receiver and transmitters strung out in a long line across a continent, the new design called for a single receiver and transmitter located at each site. Rumors also circulated that the new design would also include pulsed radars at each site to actively track individual objects as well as maintain a massive detection fence. This new plan would significantly upgrade the usefulness of the new S-Band Space Fence. Not only would it be able to track an estimated 100,000 small space objects that are not tracked by any of the current radars, but the new locations being considered would vastly improve the geographic coverage of the SSN. With the exception of the radar on Ascension Island, all of the sensors in the SSN are currently located in the Northern Hemisphere. The vast majority of the radars in the SSN are concentrated near the North Pole and the outer perimeter of the United States as a result of their missile warning heritage. This overabundance of tracking coverage in the Northern Hemisphere results in more errors estimating the portion of objects’ orbits over the Southern Hemisphere, long gaps in tracking for objects in certain orbits (including some types of launches from China), and significant difficulty in tracking objects in certain rapidly decaying orbits. However, this new plan also came with a significant increase in cost, from the Navy’s original estimate of $400 million in FY03 dollars to an estimated $1 billion in FY09 dollars ($508 million and $1.1 billion in FY13 dollars, respectively). Of this $1 billion, $350 million would be spent on concept development using RDT&E funds to figure out how to make the system work. As the concept development phase progressed, costs continued to increase and the IOC continued to slip. In 2010, an Air Force press release stated that the total program would now cost an estimated $3.5 billion, while bragging that this was a “savings” of $3–4 billion in total lifecycle costs. This massive increase in costs was largely due to the technology not quite being ready for what the Air Force wanted to do. A Government Accountability Office (GAO) report issued in 2011 stated that the initial site for the S-Band Space Fence had five critical technologies that were immature, each with a Technology Readiness Level (TRL) of 4 or 5. The same GAO report estimates that the total life cycle of the program cost could be as much as $6 billion in FY11 dollars. By 2013, a new GAO report on the S-Band Fence program showed some signs of improvement. Total program costs had been reduced to a little more than $2 billion in FY13 dollars, including $1.2 billion in RDT&E costs and $832 million in actual procurement. These costs are double the estimate of overall program cost in 2009 and nearly triple the estimated cost for concept development, but significantly lower than just a couple years earlier. However, the 2013 GAO report also notes that these cost savings were realized in large part by procuring two, not three, geographically distributed S-Band radars. The first site is planned for installation on Kwajalein Atoll in the South Pacific, likely due to its geographic location, existing communications infrastructure, and heritage of radar development and operations. Tentative plans exist for a second site to be placed in Western Australia, but it remains to be seen if additional cost growth will further reduce the number of sites to just one. As it currently stands, there is uncertainty in when exactly the S-Band Space Fence program will finally deliver operational capability. Under the current FY14 budget scenario, it appears that the funding for the S-Band Space Fence will go through Congress mostly intact. Both the House and Senate markup of the FY14 NDAA contain the full amount of $400 million the US Air Force is requesting for Space Situational Awareness Systems, which includes the FY14 funding for the procurement of the S-Band Fence. The Senate FY14 Defense Appropriations Bill also includes the full amount. However, the House FY14 Defense Appropriations bill contains a $50 million reduction to the request, with the justification given as “a one year schedule delay”. Remarks made by General Shelton suggest that this delay was the result of funding decisions made by the Pentagon, not Congress. The decision has resulted in the delay of yet another year of the award of the final procurement contract. As it now stands, the contract will be awarded in March 2014 and IOC of the first S-Band Fence on Kwajalein is slated for 2018. However, what capability those funds will buy is still in question. Rumors are that the S-Band Space Fence is facing another requirements modification that could mean the loss of the ability to do uncued detection of objects in MEO, leaving it only capable of doing uncued detection of objects in LEO. If this happens, it would mean a significant step backwards in broad area surveillance capabilities from the current AFSSS. Thus far, this article has looked at the technical capability of the existing AFSSS and what impact its shutdown would have on space surveillance, the current budget situation for continued AFSSS operations, and the status of the new, planned S-Band Space Fence. None of this has revealed a precise answer as to why AFSPC has announced the shutdown. While closing down the AFSSS would not have a significant impact on the ability of the US military to accurately track medium to large-sized space objects, it would degrade the uncued tracking capability and overall situational awareness of the SSN. Moreover, the cost savings of $14 million are miniscule compared to the cost of operating other sensors in the SSN, plus the Air Force FY14 budget as it current stands in Congress includes funds to keep the AFSSS operational. All indications are that those funds will be approved by Congress. The only remaining possibility is that there are plans in motion behind the scenes that undercut the FY14 budget scenario. While it is true that none of the current budget planning includes sequestration, the Budget Control Act of 2011 remains the law of the land and there appears to be no progress on a political deal between the White House and Congress to undo it. Thus, despite the great efforts the Pentagon, Congress, and the White House are taking to pretend that sequestration doesn’t exist, the Pentagon is also quietly making plans for what happens when it does get enforced. The final contract award for procurement of the S-Band Space Fence on Kwajalein was put on hold earlier this year pending the completion of the Strategic Choices and Management Review (SCMR) by the Pentagon. The SCMR examined how budget cuts of various levels will impact the Department of Defense and its mission and, in particular, what impact sequestration will have to major procurement programs. The SCMR looked at three levels of cuts: the existing $100 billion in voluntary cuts over 10 years, a middle-road scenario where a deal between the White House and Congress to end sequestration results in cuts of $300 billion over ten years, and a “worst case” scenario where there is no deal and the Pentagon is required to undertake the entire $500 billion in cuts over ten years imposed by sequestration. Although the SCMR did not make any specific decisions, it did frame the choices DoD must make depending on the level of funding Congress appropriates. Moreover, this level of appropriation may change drastically depending on the negotiations between the White House and Congress over sequestration this fall. Thus, it is possible that AFSPC is canceling the AFSSS in anticipation of budget cuts yet to come as a result of the sequestration negotiations and the choices they will force the Pentagon to make. Aside from the paltry direct cost savings, eliminating the AFSSS allows AFPSC to make two arguments in support of the S-Band Space Fence as one of the procurement programs that should remain funded despite those cuts. One, that it is wholly committed to the S-Band Space Fence as the cornerstone of improving space surveillance and SSA. Two, that the existing AFSSS is too old and outdated to be useful, making the new S-Band Space Fence is even more critically important to protecting the hundreds of billions of dollars’ worth of US space assets that are a vital component of US national security. If that is the case, then it’s likely that the target AFPSC is trying to influence is the Pentagon and not Congress. The new S-Band Space Fence is not a high-profile enough program to attract significant Congressional attention. While large in size for a space surveillance program, it is tiny compared to other major defense procurement programs. Space surveillance and SSA are also not issues that attract a lot of special interest groups. Absent the money or special interests, it is highly unlikely that Congress will not have the political motivation one way or the other to affect the S-Band Space Fence. That means the decision over whether or not to keep the S-Band Space Fence alive will be made in the Pentagon and the task of AFSPC is to ensure that it has a strong enough case to keep it above the redline. From the perspective of space surveillance and SSA, it is easy to see why AFSPC wants the S-Band Space Fence so badly. The current SSN does a good job of tracking the 23,000 or so objects larger than 10 centimeters, which allows the US military to predict potential collisions between active satellites and those larger debris objects and warn satellite operators. But they are effectively blind to the estimated 480,000 smaller objects between 1 and 10 centimeters (0.4 and 4 inches) orbiting the Earth. Those objects are too small for enough of the current SSN sensors to track reliably, and represent a significant collision risk to active satellites that currently cannot be protected against. A new S-Band Space Fence that can detect some portion of those objects smaller than 10 centimeters would go a long ways to improving the ability to protect satellites from collision that could damage or destroy them, as well as deliver a number of national security benefits. It may be that this gamble will pay off and the end result will be an S-Band Space Fence that significantly enhances the space surveillance and SSA capability of the US military in the near future. But it is a gamble, and one where AFSPC has clearly made a specific choice to pursue a shiny new toy with lots of promise and excluded other options. These excluded options include upgrading the existing AFSSS, which would not only extend its life, but also increase its accuracy and sensitivity to small objects. Estimates from the AFSSS Program Office are that these can be done for around $300–400 million dollars and at little technical risk, although they will not deliver the same performance as what the new S-Band Space Fence promises or the additional geographic coverage. Other excluded options include working with other countries or the commercial sector to find other ways of augmenting the SSN’s capabilities with outside tracking data, an option that many in the US military actively shun. A significant factor in the decision to pursue the S-Band Space Fence option is the culture of AFSPC itself. For decades, its mission has been on space surveillance and the primary metric by which it measures mission performance has been accuracy of tracking data and element sets. This includes having complete control over the sensor that collects the data so that it can be fully understood and properly calibrated. Data from sensors outside the control of AFSPC are generally shunned, as they could have errors or deficiencies that degrade the entire data set. Although there are techniques that have been developed in other fields for handling this problem, they are not generally recognized or practiced by the space surveillance community at AFSPC. As is always the case, the metrics that are used to measure performance shape the decisions that are made based on those metrics. The emphasis on accuracy may come at the expense of wide-area surveillance or situational awareness, which is a different metric by which one could measure space surveillance capability. It may also be a metric that other users of SSA data outside of AFSPC value highly. There is one very important element of risk in the gamble by AFSPC to bet the future on the S-Band Space Fence that needs to be kept in mind: JMS. Also a very troubled acquisition program, JMS is slated to replace the main computing and IT systems at the JSpOC. Without it, the S-Band Space Fence is useless, as the existing computing systems cannot handle the volume of observations or increased number of catalog objects that S-Band Space Fence will deliver. The probability that JMS will be in place in time is low. The Air Force has undertaken multiple programs over the last twelve years in an attempt to replace the current computing systems, all of which failed. AFSPC announced in 2011 that it was reassessing its strategy for JMS yet again, calling into question whether or not it can finally be the program that succeeds. One wonders what the situation would be like now if the Navy had retained control and finished the original S-Band upgrade in 2005. It would not have been as capable as what the Air Force envisions for the entirely new S-Band Space Fence nor added to the geographic coverage of the SSN, but it would have been something that would have contributed to the mission by improving the ability to track smaller objects. As it stands, the Air Force has already spent $250 million and nearly ten years trying to get something better, perhaps at the expense of good enough. Only time will tell whether or not this gamble pays off and AFSPC’s dogged pursuit of the new S-Band Space Fence instead of other options was the correct decision. In the meantime, it should be noted that the result will have a much bigger impact than just on the ability of the US military to perform the space surveillance mission. As it stands, the entire world is highly dependent on the US military for SSA and in particular the information necessary to avoid collisions in space. The United States has quietly taken steps to reinforce this reliance because it allows the US government to control the flow of information and thus help protect some of its own activities in space. However, should the Air Force’s optimism with the S-Band Space Fence and JMS prove unfounded, it could have widespread and long-lasting consequences for both faith in the US military’s SSA capabilities and the long-term sustainability of the space environment itself.